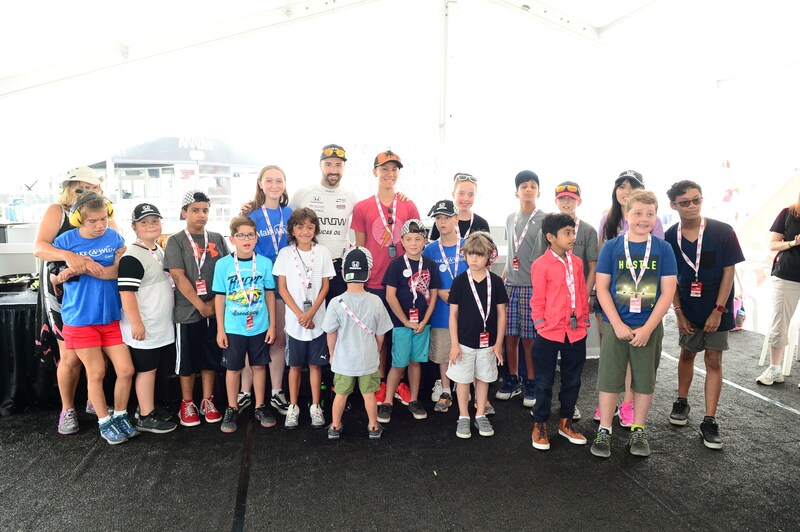 TORONTO, ON (July 16, 2018) – Thanks to the incredible generosity of race fans, the Ontario Honda Dealers Association (OHDA) and the Honda Canada Foundation (HCF), nearly $90,000 was raised for Make-A-Wish® Canada during the Honda Indy Toronto race weekend. This marks the ninth consecutive year of Make-A-Wish® fundraising efforts at the race, which has generated a total of more than $690,000 for the organization dedicated to granting wishes for children with critical illnesses. All contributions from race fans over the weekend were matched dollar-for-dollar by the Honda Canada Foundation, Honda Canada’s national charitable arm. Race fans of all ages were once again treated to the speed and spectacle of the race and the fun of the surrounding festival on Fan Friday. Instead of admission, attendees were encouraged to make a contribution to Make-A-Wish upon entry into the race. Donations were also accepted throughout race weekend for a variety of games and activities including face painting, racing simulators, James Hinchcliffe suit signing and Honda Junior Red Riders off-road riding program. Make-A-Wish creates life-changing wishes for children with critical illnesses. We are on a quest to bring every eligible child’s wish to life, because a wish is an integral part of a child’s treatment journey. Research shows children who have wishes granted can build the physical and emotional strength they need to fight a critical illness. Headquartered in Phoenix, Arizona, Make-A-Wish is the world’s leading children’s wish-granting organization, serving children in every community in Canada, and in more than 50 countries worldwide. Together, generous donors, supporters, staff and more than 1,100 volunteers across the country grant more than one wish per day, on average. Since 1983, Make-A-Wish Canada has granted close to 7,500 wishes across the country; more than 600 last year alone. For more information about Make-A-Wish Canada, visit makeawish.ca.